Discussion in 'Fan Fiction' started by Pig's Laundry, Mar 27, 2017. I'm working a couple of fan fics (my first ever, whoohoo!!) and it would be super duper helpful if you guys could help me out with figuring out the characters. Writing some info about the characters personalities, goals, relationships with other characters etc, would be very helpful. Big Bird is my favorite character, but I dread writing for him because it's surprisingly hard. I think Baby Bear's characterization is rather subtle too, so he's a little difficult to write for. I can try to help when I have the time. I'll message you with some ideas! How about a character who suffers from ADHD? Since we now have a character who has autism and all. Right, perhaps I wasn't clear enough: I need descripitions for already existing characters like Big Bird, Telly, Elmo, etc. What are their basic personalities?What are some things Grover would or wouldn't do? What are some things he or Zoe would never say? How do they react to stress? etc. I've been watching a lot of Grover clips lately, and began to see just why he's such an enduring character. He doesn't know how to do anything right, but he's got a lot of common sense. What he lacks in brain or brawn he makes up for with ambition, honesty, respect, and long, shaggy, open arms. It is easy to think that Grover has a lot of confidence because of all of this, but he has more doubts than a character like, for example, Roosevelt Franklin. If you want to see Grover in his purest form, look back to the times he tried to help Kermit the Frog with his lectures. Even before he became an established character, you can see what I mean about Grover being very friendly, eager to help out his fellow Muppet friends. When given a task too difficult for him, he begins to realize, and sometimes worry that he doesn't have the proper knowledge to go through with it. That doesn't stop him from trying, for he knows trying is the only way to make progress. He works and slaves for his friends or customers, hoping to eventually achieve his goal, but he only ever gives up if it starts to wear on him too much, either mentally or physically, but usually the latter. 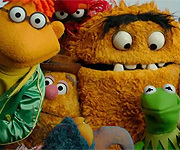 Like most of Frank Oz's characters, you may sometimes see Grover acting a little dramatic or sarcastic, for comedy's sake, but he never means anything ill. Even when Grover gets frustrated with himself or whoever he may be interacting with, he only wants what's best for himself, and for anyone. If any of you have anything else to add or correct, that would be fine. This is just my interpretation of the character. Ernie - a very naive young fellow who loves to play with his rubber ducky and shows how intelligent he is around characters like Cookie Monster and isn't very smart around Bert. Each of the human characters have a role/ function, or at least a different way of dealing with problems. How would you say some of the characters differ from each other. What makes Alan's role different from Chris', or Maria and Luis' different from Susan or Gordon's, etc? Gordon: the original fatherly figure and voice of reason, an integral character that has been part of the show since day one. Nowadays, Alan seems to have taken that role, after 20 years on SS. Susan: the original mother figure, especially for Big Bird in the first couple of seasons. 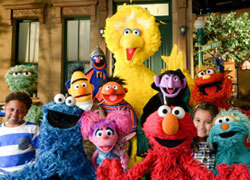 As time went on, Maria ended up in this role, especially towards Elmo. In their earliest episodes, Maria, David, and Gina were the "big siblings" to the Muppets. Savion, Gabi, and Miles went through this phase as well. Nowadays, Chris, Leela, and Nina seem to best fit this description. Mr. Hooper: the wise grandfather figure who also enjoyed spending time with younger people like Olivia and David. A key figure representing the generation gap still seen in most communities today. Bob and Luis: the uncles whom everybody liked being around. Incredibly friendly, musically talented, and willing to do funny things. All of these human characters have been there to teach the Muppets, resolve conflicts, assist with everyday tasks, and generally make Sesame Street a better place. And let's not forget all the times they wore outrageous costumes or got sprayed with water by Oscar's elephants. That's true. Maria became more of the mother figure over time, Big Bird, Elmo, and all the Muppets, but Susan also seemed to remain motherly towards Big Bird throughout the 90s (and a couple of appearances afterward). I think both Maria and Gina also became more maternal towards the Muppets after they became mothers. Olivia seemed to take on the role of the reassuring aunt many times. I recently noticed that she has a lot of songs teaching the kids lessons about patience, and how growing takes time. I always compared Bob to that nerdy teacher everyone likes but won't admit it. I had trouble writing for him too because his characterisations are more nuanced then some of the other characters. I think even the show's writers haven't known what to do with him in a while. But, SST's official description says that he has an adventurous spirit, always willing to try new things. However, sometimes he is a bit resistant to change, often times he's anxious about it. He's very smart, generally the more practical of his friends, and he has a big vocabulary. He can sometimes be a bit sarcastic. Compared to most of the characters, he is very confident in himself. In his earlier years he was much more quick to anger, but over time he became more calm and reserved, with usually only two people that can get under his skin: Goldilocks and Curly Bear, usually because they mess with his things. While he's a sweet and nurturing big brother, he can be very territorial about his things. He can be a bit dramatic when problems are out of his hands, sometimes yelling loudly to himself when he's frustrated ("Ugh, Why me!!"). In the season 44 episode "We Tee Ball" we see that he prefers drawing to sports, to point that he can get easily distracted when he's thinking about art. He's not too confrontational, so sometimes he'll hide from his problems or his mistakes to avoid conflict. He's honest though, so eventually he gains the courage to come clean. Alright, I hope this helps. Sorry if it's a bit long. Thank you @Pig's Laundry for this insight of Baby Bear’s characteristics. Well, I have enough to use for my next FanFiction. I know this might be annoying but can you co-write with me. Oh POOOOOOOOOOOOP! I'm so sorry I didn't see this before now! I'd be happy to offer assisstance if you still need it, just pm me. It’s fine and yeah I will PM you about the FanFiction. Oh, how I missed this place! You're speaking the language my mind has been starving for for so long, muppet characterizations! Anyway, it's been a long time since I've seen a full episode of Sesame Street, especially anything recent. I also don't know if you still could use help, but Telly is my favorite of the ones you mentioned, so here are my thoughts. The first word that comes to my mind when I think of Telly is loud. He is quite passionate about everything he does, and can be rather dramatic and extremely anxious sometimes.. He also has a bit of that dry sense of humor, more common with older characters. Like with all Sesame Street characters, he's friendly and likes to help others, but he doesn't seem as constantly bubbly or perky as some of the others. Oh yes! I would love for everyone to keep adding to the thread. Like you, characterization is a huge point of interest for me, plus I think this thread could really help a lot of new writers. I was thinking about Baby Bear and his big thing is he’s compassionate for his friends. Like whenever something scares Telly like on the episode where they go camping.